As a result of the allegation of Kedah government allocations 30% rebate, the hijack issue of Muar Kundang Ulu SJKC Kung Yu surfaced once again. The Chairman of SJKC Bukit Kepong Board of Directors unveiled the hijack incident during a Teachers' Day dinner in 2006. The government funds for refurbishment of SJKC Ai Hwa in Panchor and SJKC Kung Yu in Kundang Ulu was misused. 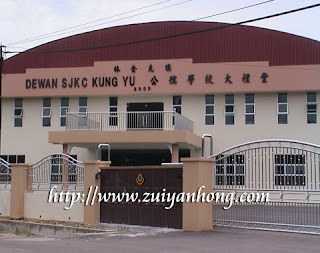 The money released for SJKC Kung Yu was RM30000 but the work done was valued at only RM3000. Response to the censure, former Deputy Minister of Higher Education Datuk Seri Ong Tea Keat who was also attending the dinner, severely condemned government officials suspected of corruption. The reprimand ended up with crossfire between Ong Tee Keat and former Minister of Education Datuk Seri Hishammuddin Hussein. The war of words between the two Barisan Nasional leaders was ceased by former Minister of Works Datuk Seri Samy Vellu and former Minister of Housing and Local Government Datuk Seri Ong Ka Ting. In the end, SJKC Ai Hwa and SJKC Kung Yu regained the funds for upgrading the school buildings. With the assistance of Datuk Seri Ong Tee Keat, SJKC Kung Yu obtained an amount of 1.2 million to reconstruct the school infrastructure. Eventually, a large auditorium and a block of three-story school building were completed in 2008. Because of daring reveal the truth, Datuk Seri Ong Tee Keat retained his Pandan parliamentary seat during the previous general election. However the rest of MCA Selangor parliamentary candidates were defeated disastrously during 308 Political Tsunami.